I thought I would start a small series and see where it goes. Fragrance is one of my first love and I have a pretty extensive perfume wardrobe, but lately I haven't felt all that enthusiastic. I still buy full bottles occasionally and I almost always pick fragrance samples if freebies are offered with purchase. So eventually I ended up with a boxful of perfume samples as well as some minis that are begging to be spritzed on. This is my effort to more diligently and consciously try out new scents and have records of them. I'd like to write them in simple and casual words (mostly because I do not know the big poetics ones that seem to be required for good perfume reviews) with my very personal thoughts. Yeah, more like a diary. First up is Marchesa Parfum D'extase. I almost bought a full bottle unsniffed. Of course, I love studying all the notes and imagining how it would smell based on my experience with each notes or the combinations (The truth is that you find very little magic in the perfume world nowadays). Normally I would test with a sample for days to make a wise decision, but once in a while, I gamble, because that is what a perfume fanatic does sometimes. But in this case, it was the bottle itself. Just look at it. Lucky for me, a legit sample was offered with a Sephora purchase. A case in which my pretty money was saved. I like this scent, but I do not love it. I think it well represents the designer's image especially of their classic (a little over the top) dresses, but it did not do much for me, just like that I would hardly wear Marchesa dresses in reality. What I really like is the subtle top note with white floral. White floral is the main thing I get when I first spray this on, and it is such a soft pretty thing. I mean, it did not interfere with my morning coffee, and how many white florals do that? Pity that soft elegance is short-lived and does not really connect to the next stage. 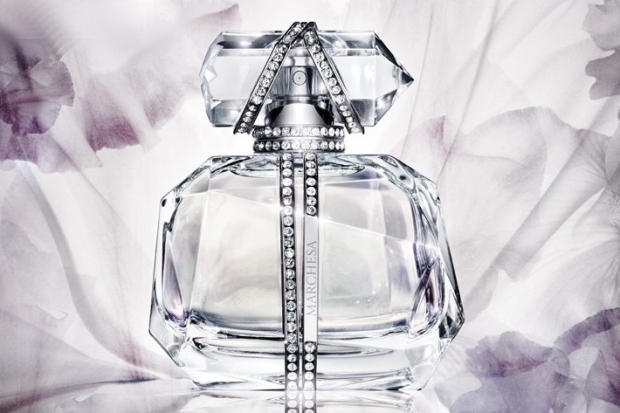 Marchesa Parfum D'extase has many floral notes, but the initial jasmine is the only thing recognizable, then brief seconds of nondescript florals, and it quickly morphs into a very soapy scent. Yes, it smells like soap. It is not like ivory soap or fresh-out-the-shower kind (for that, I'd suggest Philosopy Pure Grace), but a very expensive soap maybe smelling a little dated. There is no doubt that it is a very sophisticated and feminine scent. I love florals with soft musk, but prefer something a bit edgier with sweet wood base. Parfum D'extase's long lasting soapy base is harmless and friendly, but I think it is a little annoying, although I don't aim to sound too mean. Iris Flower, Freesia, Black Currant, Young Violet Leaves, Lotus Flower, Night Blooming Jasmine, Bulgarian Rose Water, Orange Blossom, Iris Root, Ambrox, Captive Musks. Gosh I know what you mean about being taken by perfume descriptions and a gorgeous bottle, and then feeling sorely disappointed by the scent itself. I loved reading rave reviews on Elizabeth and James' Nirvana perfume - the white seemed to be singled out as the stellar one but I actually thought the black one stood out far more for me but still it was not great enough to be purchased. It smelled like it could be in the family of Tom Ford's Black Orchid type perfumes but still...it lacked a little something. Love the packaging and name and everything though. I actually have both Black and White of Nirvana. I haven't tried the Black but I am quite fond of the White. I do agree with you. I don't think they are hype-worthy. I enjoyed reading this and look forward to further installments in the series. I can relate to feeling that there is no much special in the perfume world these days. You could pay an awful lot of money and still end up with something that eventually smells like a department store beauty hall, alas. Hi Bella! :) Thanks for your comment. You just described the boredom of modern fragrance market! - a department store beauty hall. Maybe it is because I have found many good ones and feel content about my existing collection, but maybe I feel bored about new launches and such because of lack of the magic. Alas, indeed. I love posts about perfume and they're among the most difficult to write for me..
That bottle is so pretty! But you are right, really soapy scents aren't that original anymore. I find a lot of these 'designer" fragrances can smell the same. I know, right? If somebody has an empty bottle of that on blogsale or something, I'd totally buy it. LOL. That is such a good idea to have a box for them. I should find a box for them. I have a few here and there and I usually do not remember where mines are until I find them and sniff them and forget them again for who knows how long. LOL. I just counted and added the volume and it is equal to a full bottle of perfume. I am not aiming to use everything up or anything. But this way, at least I would be able to experience everything. Yay, more perfume posts, please! I only smelled this one in store and it was a no for me - there are so many pretty white florals, right? And Amazing Grace is a cheaper clean white floral (and a handy summer smell for me when I just want to smell fresh). Pure Grace was my favourite for a few years. :) I had this sample too but gave it away without even sniffing because I had a feeling it wasn't really going to be my thing. I hope you continue with the perfume diary! It's fun reading short general impressions without being too serious about it. I think you did the right thing. Philosophy 3-in-1 is pretty useless as a shampoo. I mean, I love the scent but it does not linger after shower.